"I wake up everyday, asking "What am I doing today? That's cool "and I am now talking to you nice people"- Smooth!!! 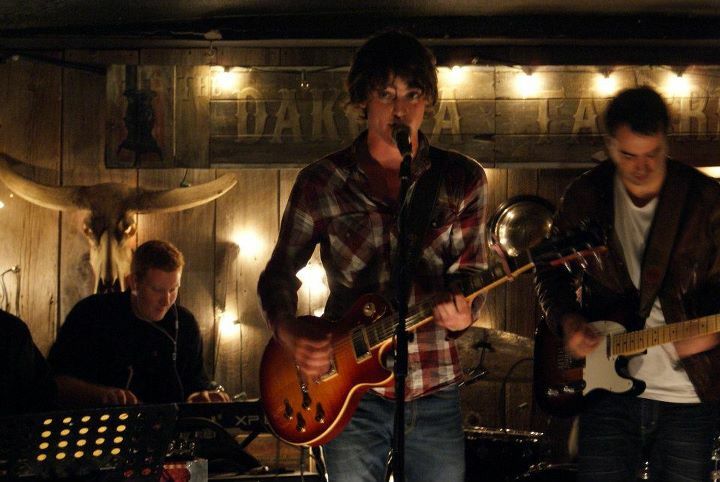 I and my fellow editor, Nicholas, looked at each other, blushing from his compliment during a lovely interview with Nova Scotia native country rock singer songwriter, Carleton Stone at Dakota Tavern on September 29th. "I love it here, it's kind of right up my ally"- At the intimate Dakota Tavern, Carleton Stone spared sometime with us, while getting ready to rock the night of his CD release party in Toronto. After self producing his debut album, "Carleton Stone Drives the Big Wheel," he welcomed a Juno award winning producer, Hawksley Workman for his self-titled second album. "I've been a huge fan of Hawksley, so the first time that I came up and wrote together with him and other people in his apartment in his spare bed room/ studio, I was like "I am Hawksley's aparment right now!!!" and it was kinda surreal." After having Workman on his side for the second album, he expressed his preference on having a producer. "When you are recording by yourself, you are second guessing all the time, especially when you are new. You are the one who is making all the decisions, so just having Hawksley there took lots of stress off me. I love having a producer. I'm sure I will make another record which I will produce somewhere down the road. " It's a bit of a cliche, but I had to ask this question: "Who would you like to work with for the next record in the future?" "Bon Iver- As a producer I just listen to his stuff and his own work and geeked out about his music. David Bottrill-he produces Muse and Tool, but he also does more stuff like country, too." His hectic schedule will continue even after the CD release and a couple of Ontario shows. "I have some East Coast shows, which starts off in October. then I am heading down to Nashville for bit. And I come back and go to a full Canadian tour with a band called " Heartbroken." That takes me till the end of November, and I will probably back in Toronto to do some writing"
Thank you Carleton for his time before his set!!! His self-titled album, "Carleton Stone" is available from his website. Don't forget to check his Facebook and Twitter, too! Also click here to check my review of the night and video from the show.